Gladly that I broke my routine and baked this chicken pie, instead of cooking rice, for our dinner the other day. Even though my husband is a rice lover, he’s pretty attracted by the delicious fillings. We could have all the proteins and vegetables we need in a pie. For myself, I love the pie crust in particular, that's made and adapted from Maggie Beer’s Sour Cream Pastry recipe. The sour cream made the pastry taste so wonderful, producing a soft and flaky texture, that you don’t want to miss any bit of it. What can beat a home-made pie? It smelt so good, when it’s baked fresh from the oven. 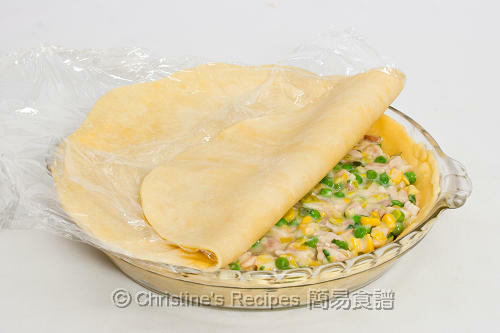 The pie pastry and fillings can be made in advance, nicely kept for days in refrigerator. You can resemble and bake this pie on the go, then enjoy a hot delicious pie without waiting too long. This chicken pie is pretty versatile, suitable for summer or winter days. Place butter and flour in a food processor, pulse to mix until it looks like breadcrumbs. Add the sour cream and continue to pulse until mixture just comes together. Gently shape into two discs. Do not over-knead. Wrap in plastic film and refrigerate for about 20 minutes. Remove crust disks from the refrigerator. Roll out one between two plastic films to a 32cm circle, about 3mm thick. Carefully line the pie dish as the base. Roll out another crust disk to a 25cm circle, as before. Keep it in plastic film. Put both pastry disks back to refrigerator for later use. Dice chicken. Season with salt and pepper. Pan fry chicken over medium heat until cooked. Set aside. If using frozen peas and corn kernels, soak them in boiling water for 10 minutes. Drain well. Add 1 tablespoon of vegetable oil and 10 grams of butter over medium-low heat. When the butter begins to melt, add leek, garlic. Cook until fragrant and the leek softened. Toss in the bacon, continue to cook for about 2 to 3 minutes. Stir and combine occasionally. Toss back the chicken. Pour in white wine, cook for 2 minutes. Sprinkle the flour, stir to combine. Add the stock and cream. Cook to reduce the sauce by more than half and thickened. Stir in peas and corn kernels. Taste by yourself. Season with salt and pepper if necessary. Stir in parsley. Transfer the fillings into a large bowl and let it cool down. Refrigerate it for 20 minutes. Preheat oven to 220C (425F). Prepare the egg wash: mix egg yolk and milk in a small bowl. Remove both pastry disks and the fillings from the refrigerator and let sit for a while until they soften just enough to be workable. Fill the case with the fillings, topped with pastry. Crimp the edges to seal and score the top pastry. Cut a 1cm-slit in the middle of the pie. Egg wash the pie. Bake in preheated oven for 10 minutes. Then reduce heat to 200C (395F), continue to bake for a further 35 to 40 minutes, or until golden and cooked through. If the top is browning too quickly and too much, loosely cover with a layer of foil until the dough is cooked through. Remove from the oven. Serve hot with salad greens. I'm a huge chicken pie lover and yours look and sound so delicious! 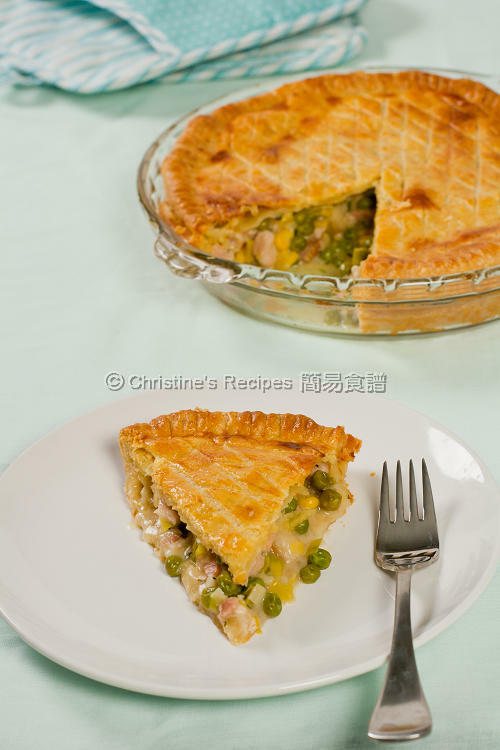 I love love chicken pie:) Wonder whether I can get the sour cream pastry here, would definitely want to try this. oh yum! That recipe looks like a winner. 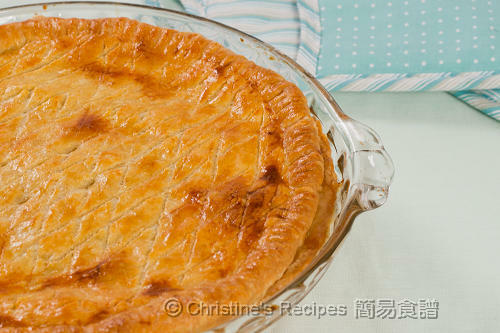 A creamy hot pie for cold winter sounds sooo good! Not tried a sour cream pastry before... the pie does look sumptuous. That is one lovely pie! I love this pastry! i love the chicken pie! I miss homemade chicken pie! I never thought of putting sour cream in pie crust! Next time I make I pie, I think I'll try it! For the filling, I used pure cream (single cream). For getting the pastry ready in advance, either way will do. I just rolled out the pastry and arranged in pans before chilling, it's much easier and get ready for anytime when I like to use them. The downside is that the pans might take up some room in the refrigerator. I still don't know what is pure cream? Is it heavy whipping cream? Either whipping cream or heavy whipping cream will work for making the filling. No problem. Can I bake the bottom of the pie crust first? That way, i can pour cooked filling onto already cooked pie crust bottom, then cover with raw pie crust on top and just bake for less amount of time until the top is brown. Would this work? Think that your method will work too. Feel free to adjust to your liking.